This blog will conclude our VSClinical Best Practice Workflow series and focuses on one of our new reports: VSClinical ACMG Gene Panel Template. This template is valuable because it automatically enters your variant interpretation from the ACMG Guidelines into the report and eliminates the need for manual submission. 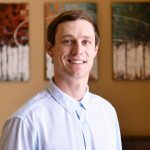 I would like to explain how to properly implement this report into your workflow and the features that make this report unique. 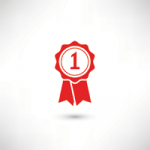 The first step is to select the assessment catalog in VSClinical. 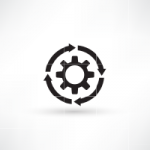 This can be done using the configuration icon (gear icon) next to the ACMG Guideline drop-down menu. Once you have selected your assessment catalog, you can also create your variant sets: “to evaluate” and those to include in Primary and Secondary Findings. As shown below, the latter is particularly important because they will be displayed in the final interpretation section in VSClinical and are pulled into the report as Primary or Incidental findings. 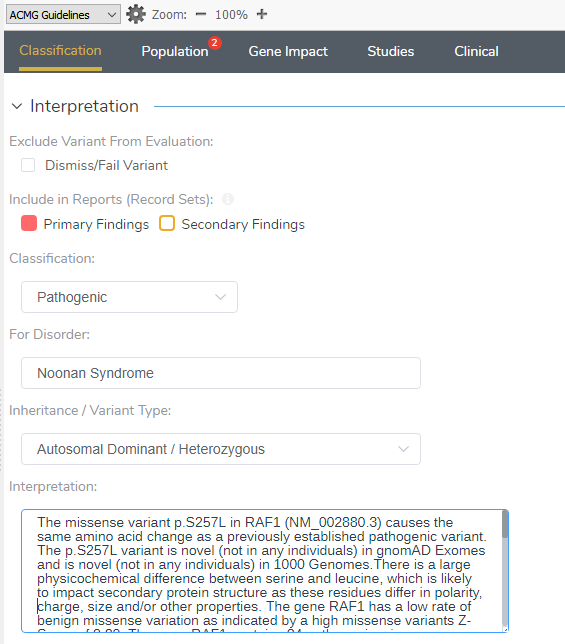 The new report template uses interpretations stored in your assessment catalog and will associate variants to created variant sets: Primary and Secondary findings. Following evaluation of the variant in VSClinical, you can include variants in the Report as Primary or Secondary Findings. 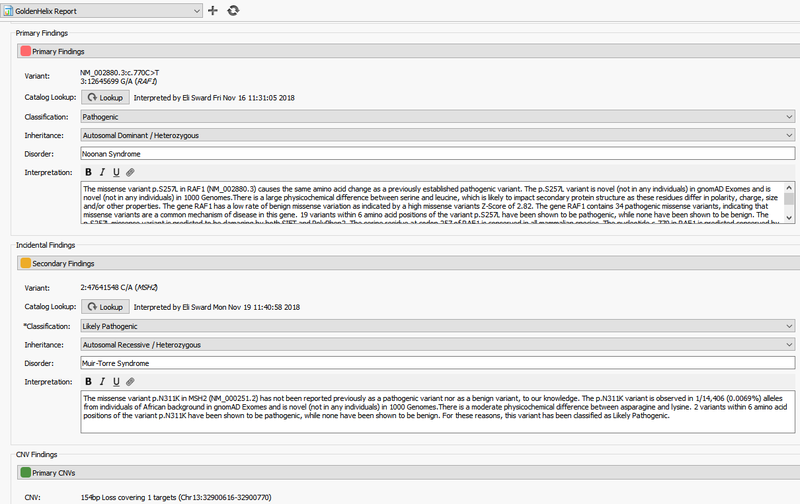 Once you associate the variant as Primary or Secondary findings in the Interpretation section of VSClinical, as shown above, you can then open the report tab and locate the template. The new report template is accessed by clicking on the (+) icon, shown below, and selecting the VSClinical ACMG Gene Panel Template. 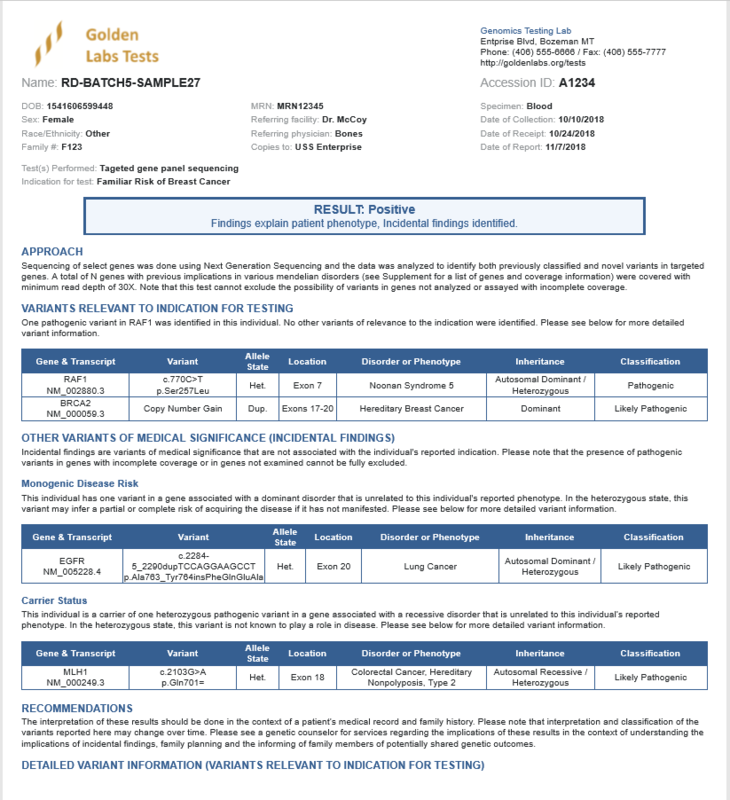 After designating a report template name, you can then link the template with your ACMG assessment catalog. This is done using the Configure Report Template option with the gear icon located in the upper right corner. Notice that in the configuration setting there is also a field to incorporate your CNV assessment catalog as well as modify other report parameters. 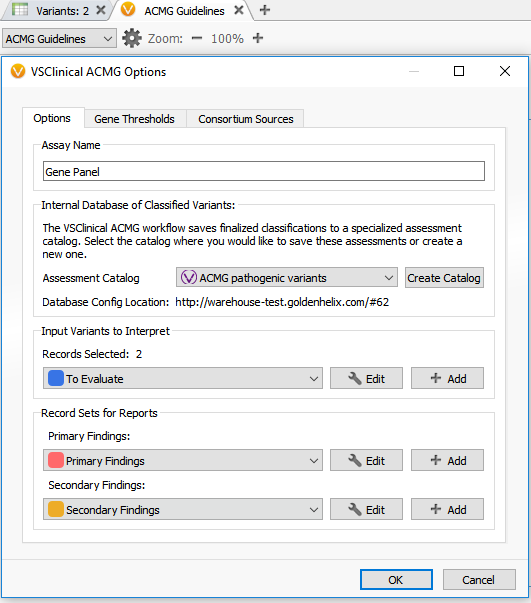 Clicking on the plus icon in the report tab will provide access to VSClinical ACMG Gene Panel Template and the gear icon in the upper right corner of the report tab is used to configure the report template and select your assessment catalog. Once you have your report template configured, you can select which variant set you want to have pulled into your Primary, Incidental, as well as CNV findings. You can then automatically pull your interpretation from your ACMG evaluation by clicking the Lookup button, shown below. To finalize the process, you can then verify the report, sign off, and render. Once the report template has been configured to your assessment catalogs, you can use the Lookup buttons to pull in your interpretation from your VSClinical evaluation automatically. This concludes the final blog of VSClinical Best Practice Workflows, which I hope has provided more insight into the tools available in VSClinical. Taken together, this series was intended to help improve your workflow, enhance your understanding and navigation of VSClinical, and give insight into a new ACMG report template. Thank you for taking the time to read our blogs, and if you have any questions or comments, you can always reach out to us at support@goldenhelix.com.